The Music of the Love Hormone . Mihail Yossifov is one of the most active and successful young Bulgarian jazzmen. He finished the trumpet class of Rusin Atev at the National Music High School “Ljubomir Pipkov”. Later he graduated from the National Music Academy in the classes of Stojcho Radev and Angel Makedonsky. Cherishing the interest in jazz since his school days he formed ensembles with his classmates and performed at almost all the jazz forums in Bulgaria. After that he was demanded not only as a jazz musician but also as a musician for recording many music projects and film scores. Despite as a musician he has been active as a trumpet master, an arranger and composer of film scores and music for plays as well as of music for his jazz formation – Mihail Yossifov Sextet. Amongst the musicians he has collaborated with are Mike Stern, Dave Weckel, Mezzoforte, Dephazz, Peter Herbolzheimer, Karen Bernod, Poogie Bell, Max Moya, Randy Brecker, Milcho Leviev, Teodosi Spasov, Аngel Zaberski, Antoni Donchev, Hristo Yotzov etc. One of the founders of Brass Association – union of brass musicians that manages the brass festival Brazzobrazzie, the education project “Brass Hour” as well as many other successful music projects. Open, curious and loving the experiment, besides the intense work with his jazz sextet Misho is actively involved in other music projects as the charming female swing trio Sentimental Swingers and the band which unites in unique way the gypsy rhytms with jazz – RomaNeno Project. 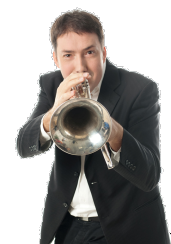 The beatiful touching voice of his trumpet sounds also in the contemporary brass orchestra Brazz ViliDJ and in Angel Zaberski Big Band Brass Association. Misho Yossifov has performed at jazz, pop and ethno festivals all over Europe – Sziget (Hungary), Exit - Novi Sad (Serbia), Nisville (Serbia), Zomer van Antwerpen (Belgium), Festival of Arts Apollonia – Sozopol (Bulgaria), International Jazz Festival Bansko (Bulgaria), etc. In 2009 Mihail Yossifov was awarded with the Golden Lyre award as a Jazz Musician of the Year by the Union of Musicians and Dancers in Bulgaria. Soon after that he got the Golden Pen award of Jazz FM and Classic FM Radios for a special merit to Bulgarian culture.